Do you remember seven or eight years ago, when oreo truffles were all the rage? I was all but sent home if I showed up at a party without them, and my friends nicknamed them "balls of fury," haha! They were a super simple mixture of crushed oreos and cream cheese, then rolled into balls and dipped in melted chocolate. So easy, but always alway always a huge crowd pleaser. 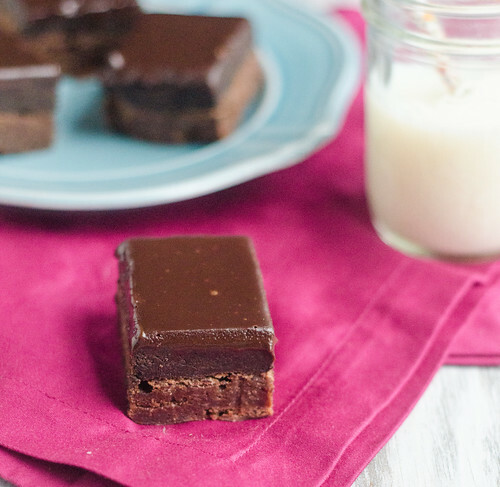 These brownies are a majorly updated and decadent version of those little truffles, and my gosh are they good! 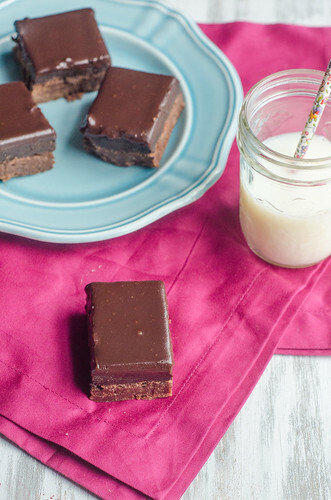 You start with a pretty simple and basic pan of brownies, top them with that oreo-cream cheese mixture, and finish them off with a layer of chocolate ganache. Um, yeah. They're amazing. Oreo-anything will always be a huge hit with my family, but these brownies were definitely a grand slam-home run-major win. How could they not be? 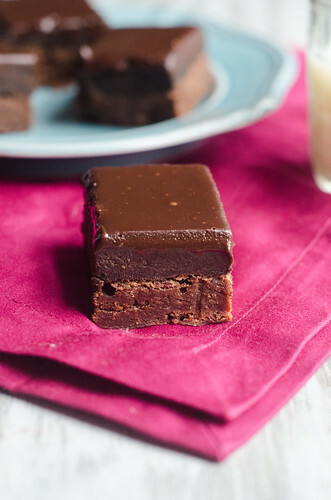 These are definitely one of the best treats to come out of my kitchen, and I foresee many more pans of these delicious brownies being made in the near future. Preheat oven to 350° F and line a 9x13-inch baking pan with aluminum foil, leaving an overhang on the two long sides. Spray with cooking spray and set aside. In the bowl of an electric mixer, cream butter and sugar together until light and fluffy, about 2 minutes. Add eggs one at a time, and mix well, scraping down the bowl as necessary. Add vanilla, salt, cocoa, and flour. Mix until just combined, being careful not to over mix. Pour batter into the prepared pan and bake for 20-25 minutes, until a toothpick comes out with just a few crumbs attached. Transfer to a wire cooling rack and cool completely. While the brownies are cooling, make the Oreo truffle layer. In the bowl of a food processor, pulse cookies into fine crumbs. Add the cream cheese and pulse until combined. Once brownies are completely cool, carefully spread the Oreo truffle layer over brownies with an offset spatula and/or clean hands - this doesn't have to be perfect, since it will be covered with ganache. To make the ganache, heat the cream in small saucepan over medium heat until it is simmering. Meanwhile, place the chocolate chips in a medium heat-proof bowl. Pour the hot cream over the chocolate, and allow to sit for 2-3 minutes. 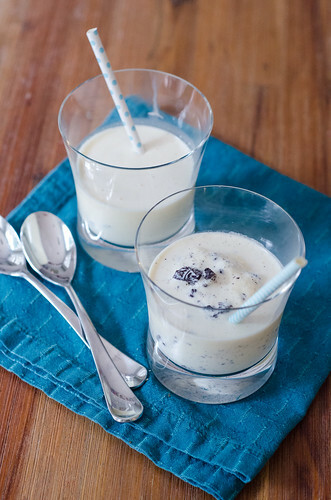 Whisk the cream and chocolate together until the chocolate is melted and smooth. Pour the ganache over Oreo layer and spread with an offset spatula. Chill in the refrigerator until fully set. To slice and serve, lift the brownies out of the pan using the foil overhang, then use a sharp knife to cut into small squares. 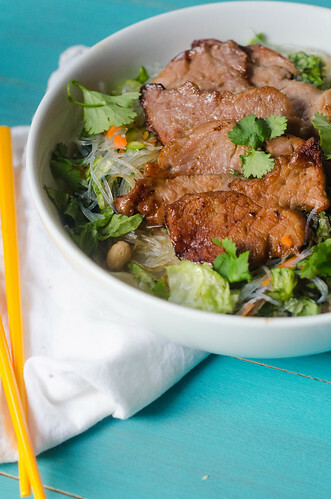 This is one of those embarrassingly easy recipes that I make dozens of times a year. As soon as spring rolls around and asparagus comes into season, this becomes my go-to appetizer and pot luck contribution. It's great straight out of the oven, at room temperature, and even chilled; so you really can't go wrong. I love to drizzle these with a balsamic glaze, but it's certainly not necessary. Just an extra little touch that makes them even more special. Same deal with the Dijon mustard. I brush each piece of prosciutto lightly with the mustard, and I think it imparts a nice little bit of spiciness, and it helps cut the rich saltiness of the prosciutto. 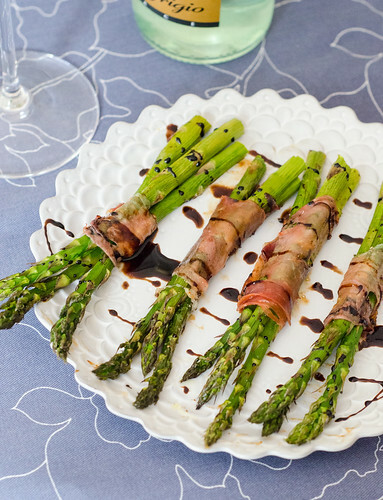 So while you could just simply wrap some asparagus with prosciutto and call it a day, the mustard and prosciutto are what elevate this dish to truly wonderful. I hope everyone has a wonderful weekend - perhaps one that involves these little babies and a few glasses of wine? Preheat the oven to 400 degrees and lightly grease a rimmed baking sheet. 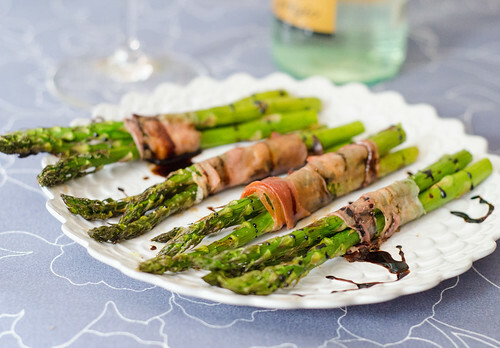 Brush each slice of prosciutto lightly with the Dijon mustard, and wrap tightly around 3-4 spears of asparagus. Lay each bundle seam side-down on the baking sheet. Drizzle lightly with oil, then sprinkle the asparagus VERY lightly with salt. Season with freshly ground black pepper. Bake 10-15 minutes, or until the asparagus is tender and cooked-through, and the asparagus is slightly browned and crispy. Before serving, drizzle with balsamic glaze. *To make a balsamic glaze, heat 1 cup of balsamic vinegar in a small saucepan over medium-high heat. 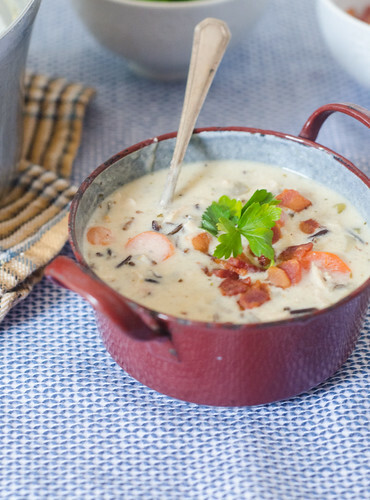 Bring to a boil and cook until it is thickened and reduced by half, 15-20 minutes. Remove from heat and cool. 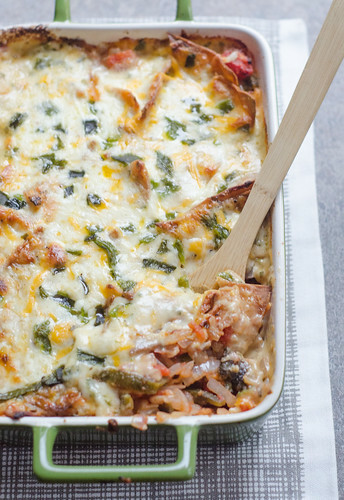 Creamy Poblano-Tortilla Casserole. Pretty much any of those words on their own send me running to the kitchen, but combined? Oh man, it's dangerous. 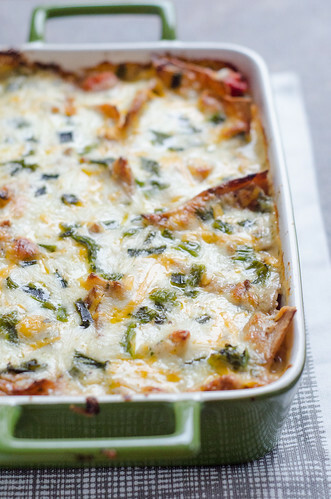 This casserole is made up of layers of crispy baked tortilla chips, a creamy, cheesy sauce, a tangy and spicy filling, and lots and lots of poblano peppers. 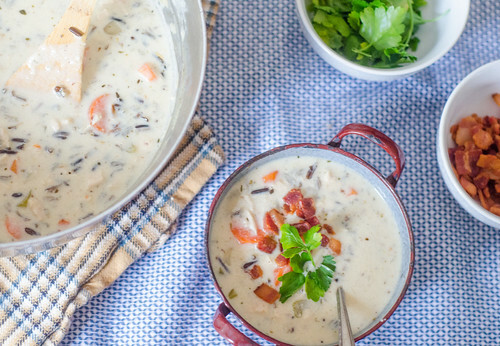 It's creamy, cheesy, crunchy, spicy, and well... just really freaking good. I couldn't decide if this reminded me more of mac & cheese or an enchilada casserole... then I realized that I didn't care. It was so awesome that there's no need to label it or compare it to anything else (though of course then I really wanted to make this green chile mac & cheese as a result, ha!). Like I tend to do most days, I prepped this baby during nap time, then just popped it in the oven when Joey was on his way home. I also put together a quick citrus and avocado salad to balance out the spice and richness of the casserole. This was the perfect meal for the end of winter - comforting and homey, but with plenty of brightness and spice from the poblanos. A winner all-around. While this is a vegetarian dish, I see no reason why you couldn't stir some shredded chicken, pork, or ground beef or turkey into the filling. Toast the tortilla wedges: Put racks in upper and lower thirds of oven and preheat to 400 degrees F. Stack tortillas and cut into 8 wedges. Spread tortilla triangles in one layer on two large baking sheets and bake, stirring occasionally and switching position of pans halfway through baking, until crisp and pale golden, 10 to 15 minutes. Cool tortillas, and leave the oven on. Prepare the chiles: Open chiles and spread flat; discard seeds and stems and cut out ribs. Cut chiles lengthwise into 1/4-inch-wide strips. Reserve about 1/4 cup for garnish, and roughly chop those strips into small pieces. Make the filling: Heat oil in a 10-inch heavy skillet over medium-low heat until hot but not smoking. Add onions, jalapeño, and garlic and cook, stirring occasionally, until softened, about 5 minutes. 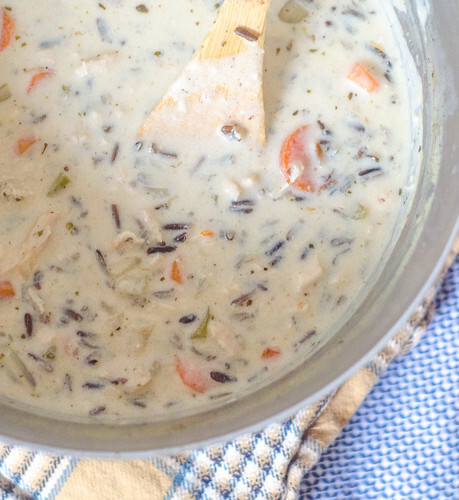 Stir in salt, tomatoes with juice, and remaining poblano strips and simmer for 2 minutes. 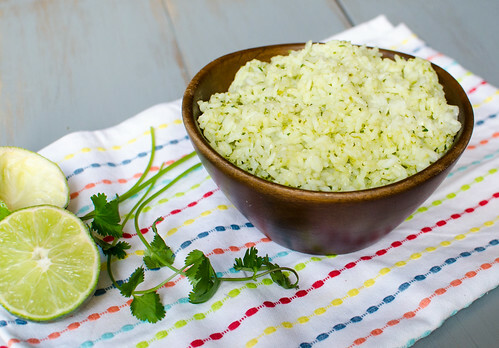 Remove from heat and stir in the chopped cilantro. Make the sauce: Melt butter in a medium saucepan over medium-low heat. Add flour and cook, whisking constantly, for 2 minutes. 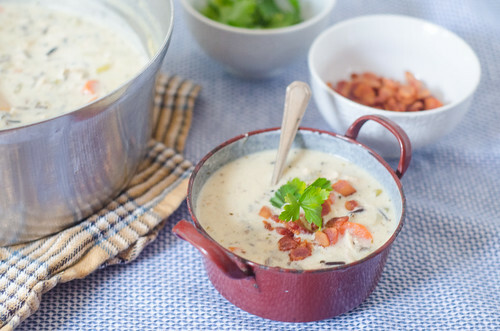 Add milk in a steady stream, whisking, and continue to cook and cook, whisking occasionally, until the sauce is slightly thickened, 3-4 minutes. Remove from heat and gradually add 2 cups of the cheese, stirring until cheese is melted, then add salt and pepper. Assemble and bake: Arrange half of the tortillas in a greased 2-quart baking dish. Spoon filling evenly over top. Cover with remaining tortillas. Pour sauce over tortillas (tips of tortillas will stick up) and sprinkle with the remaining cup of cheese and reserved poblanos. Bake, uncovered, in the upper third of oven until gratin is bubbling and top is golden, about 30 minutes. In our house, today was the next best thing to Christmas. The DVD release of Frozen! Have you seen it?? Don't you love it?! The soundtrack plays nonstop in my car, and Caroline dresses up as Elsa any chance she gets (she wore her Elsa outfit for 2 straight days when we were snowed in. No judgement!). So today was the long-awaited day, and I wanted to plan a fun night around watching Caroline's "most favorite movie in the entire world." I didn't actually plan to blog about this, but I just loved how it all came together, and Joey pretty much insisted that I share it with you asap! Troll Stuffed Mushrooms - spinach-artichoke stuffed mushrooms that resembled the "love expert" trolls. 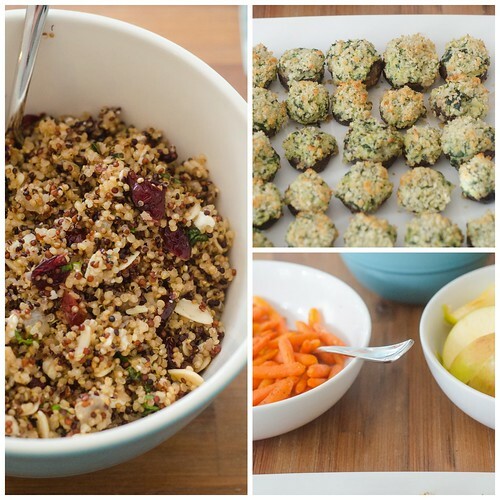 I adapted this recipe to smaller mushrooms, and they were awesome. For dessert: homemade Blizzards, in honor of the eternal blizzard that Elsa set off as she fled Arandale (Oreo and vanilla, by request). I have way too many napkins and table linens, so I was able to put together placemats and napkins that used the colors from the movie. I also have way too many paper straws and mason jars, so I worked the colors in there as well. And while I cooked dinner, Caroline cut out some snowflakes. She loves any and all art projects, so she was super excited to do this. It got her involved and gave her a sense of responsibility in our big family night. The twins also enjoyed the celebration. After dinner, we all cuddled up on the couch for the movie, and it became an instant classic. Caroline of course loved it, and sang along the whole time; but Smith actually sat still through most of the movie as well - quite a feat! He only took one short break to put together a puzzle! He loved the reindeer, Olaf, and all the special effects with the snow and ice. 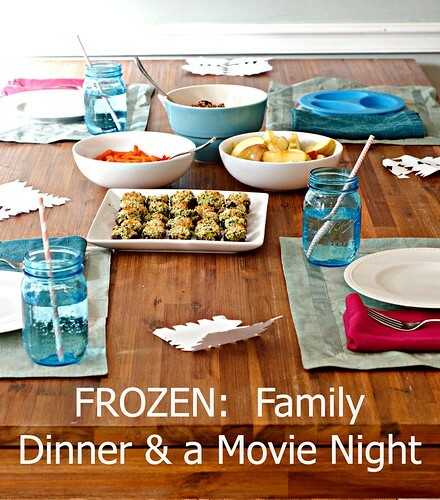 I had so much fun planning and executing this family movie night, that I think I'm going to make this a monthly tradition. 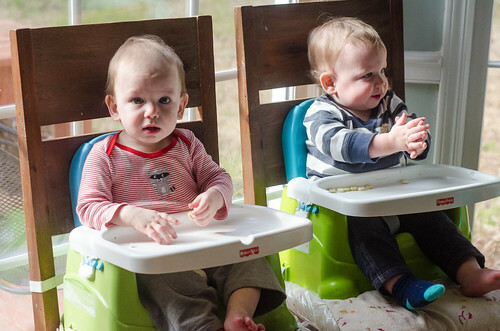 Since it is logistically pretty difficult for us to go out to eat as a family (Hi, can we have 3 high chairs, please? 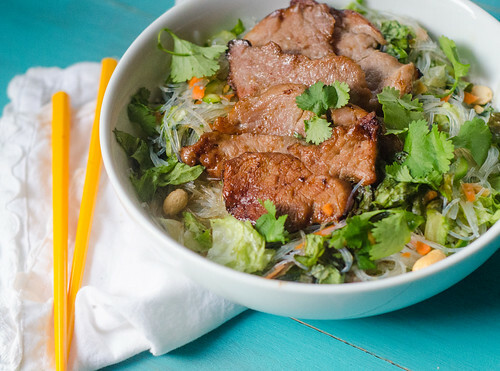 ), I love coming up with new ideas for a dinner that's out of the ordinary and fun. Last thing - go watch the movie, ASAP! Even if you don't have kids. It's really really great! I never thought I'd say this about a vegetable, much less brussels sprouts, but these are totally crave-worthy. So much so that I kid you not - I ate these for lunch for almost a week straight. 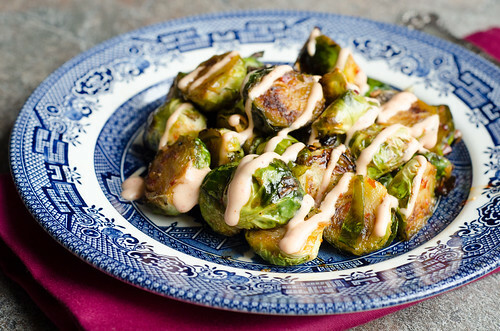 I don't know whether it's the caramelization of the brussels sprouts themselves, the sweet and sour glaze, or the utterly addictive sweet and spicy Sriracha cream sauce. My guess is that it's the trifecta. Because of their inherent bitterness, brussels sprouts lend themselves really well to these bold flavors, but I also gave broccoli this treatment, and it was awesome as well. You hit on all the major flavors here - sweet, spicy, salty, bitter, and sour. Therefore totally amazing and totally addictive. 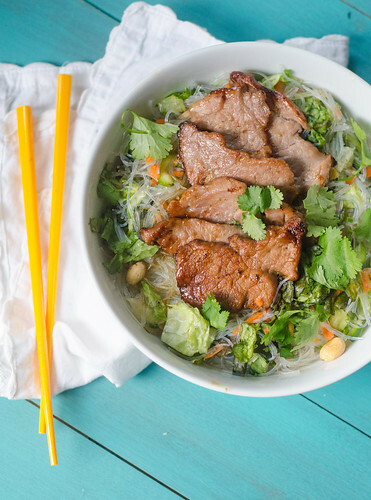 The first time I made this, I served it with ginger-garlic marinated flank steak and brown rice, and ended up just drizzling my entire plate with the sauce. It was a really great meal, but the brussels sprouts definitely stole the show. And then I made a giant plate of these again for lunch the next day. And the next day. And the next day. And you get the picture. 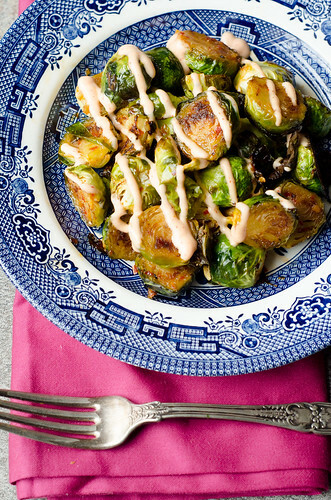 We are alllllmost out of brussels sprouts season, so get them while you still can. 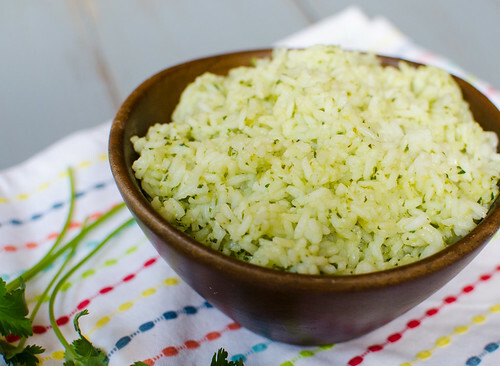 And when they're gone, make this with asparagus. Or broccoli. Or eggplant. Actually, I'm pretty sure you could slather a bunch of the glaze and sriracha cream sauce on a leather shoe and it will still taste amazing. It's that good. Trim the stem-end of the brusels sprouts, then halve. Toss with the vegetable oil, arrange in a single layer on a rimmed baking sheet, and sprinkle with salt and pepper. Roast 10-12 minutes. Meanwhile, whisk together the sweet chili-garlic sauce, soy sauce, and fish sauce. Pour over the brussels sprouts, then carefully toss to coat. Return the pan to the oven and cook an additional 5-8 minutes, or until they are charred and browned in spots, and cooked through. 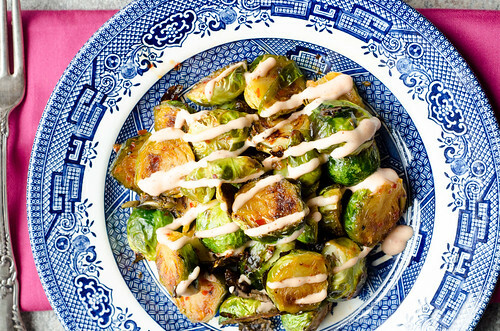 To serve, divide the brussels sprouts among plates and drizzle with Sriracha sauce. 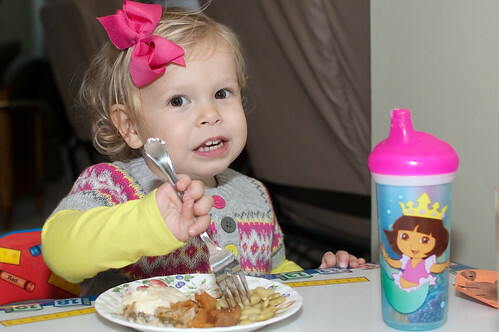 For many parents, beginning solid foods is one of the most stressful times. 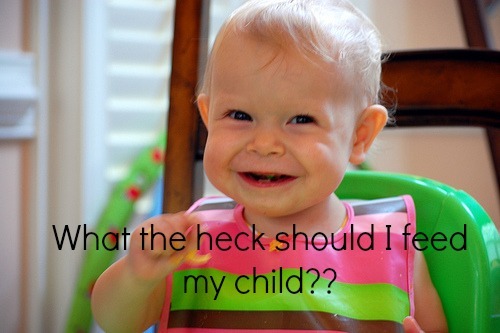 There are worries about allergies, choking, pickiness, and just what the heck to feed that baby! But instead, look at it as a chance to have fun with food. 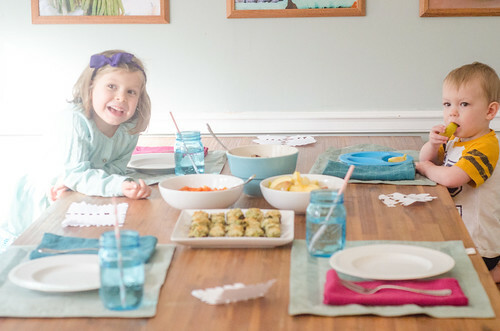 Exploring different tastes, colors, and textures with your little one, teaching them about nutrition and healthy eating, etc. Many parents go the jars-of-baby-food-route, many go the homemade-purees route, and some skip over baby food altogether! 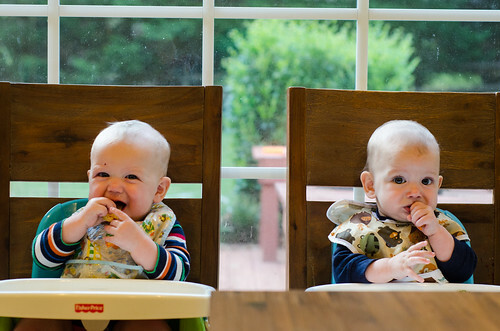 In my next installment of Feeding My Family, I'm touching on introducing solid foods to babies and then what to feed them as toddlers. I am obviously not a doctor or a nutritionist, or really even an expert. But I do have four kids, and have been through the stages several times, adjusting my philosophy and approach each time. Therefore, I do (humbly) think I have some experience to share, so here goes. Get ready, because this is a long one! Caroline was my first child, and as typical first time parents, we wanted nothing but the best (i.e. the most work possible, of course). I made all of her baby food from scratch, using organic produce. Was it doable? Yes, at the time. Sometimes I would make several batches of purees over the weekend, but most of the time I just did a batch every other night while I made dinner or after she went to bed. I didn't buy any fancy equipment or food storage system. I steamed the veggies and then used my food processor to puree them, portioned them into ice cube trays to freeze, then popped them out into freezer bags for storing. I never spent more than 10 minutes on any one puree. Once I had a pretty good stash of different fruits and veggies, I'd mix and match for her meals. 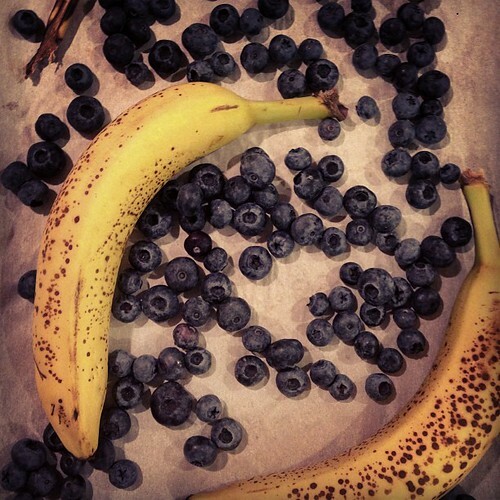 Blueberries + bananas, zucchini + corn, carrots + broccoli, peas + green beans, etc. 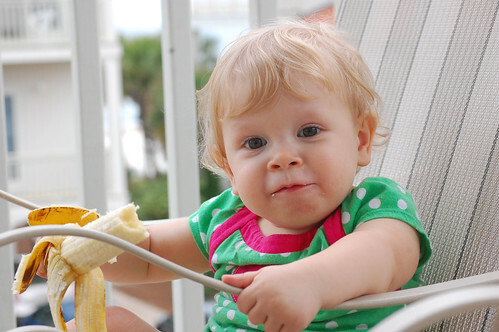 Top 100 Baby Food Purees - this was my #1 go-to resource, and used it almost everyday. Highly recommend this book. With all that said, there is absolutely nothing wrong with buying baby food, but I will say that it is much more expensive. Buying produce for baby food is much cheaper than buying jars, not to mention more eco-friendly. I did the calculations for carrots when I first started making my own baby food, and if I recall correctly, a jar of organic carrot puree was around $1, and I could make 24 servings for $3. The savings are huge, but you are having to put more work into it. I am a stay at home mom, and I had the time to spend making her food. Everyone's situation and priorities are different, and we all just do the best we can. With that said, when we traveled I bought the Plum Organics pouches and used those, and they were great. I also bought the pouches when we had a babysitter or were going out, and it was always nice to have a few on hand just in case. I used prepared baby foods quite a bit with Smith when I was pregnant with the twins and in the throes of morning sickness. So much as looking at a vegetable made me want to puke. You've gotta do what you've gotta do. Buy Buy Baby runs sales pretty often, so I use that as an opportunity to stock up. I actually still like to keep these on hand because Smith can be pretty picky, but he loves pouches. 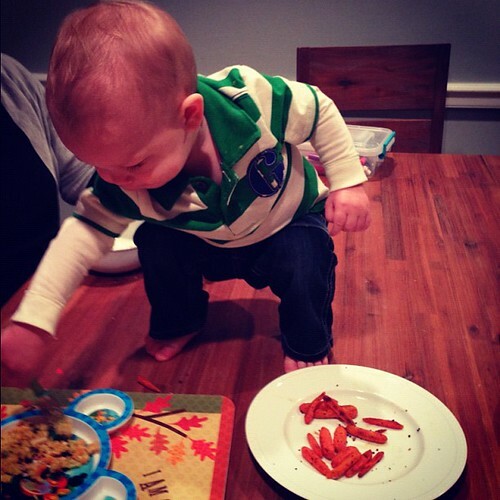 So when I'm desperate for him to eat some veggies, I turn to those. Now. Onto what to actually feed them! 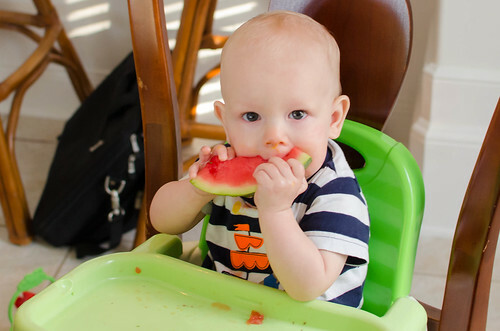 As my kids have grown, we've discovered many foods that are perfect for beginning eaters, and even into toddlerhood. 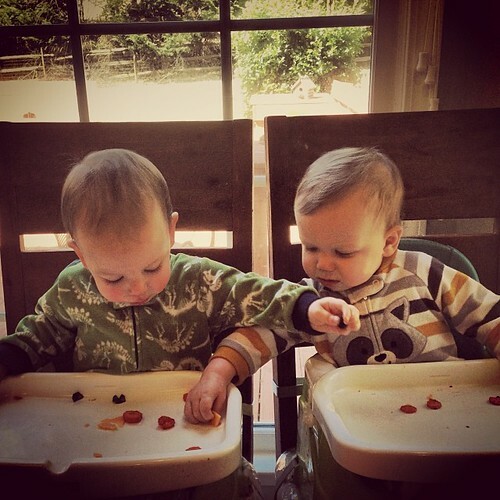 Here is a list of many of the foods that I keep in heavy rotation for Henry, Tucker, and Smith. I will be doing separate posts for breakfast, lunch, and snacks, and will go into more detail and specifics then. cinnamon-baked apples (huge hit with all the kids - toss peeled apples slices with cinnamon and a little butter, then bake at 400 until they are softened). pan-toasted okra (toast okra rounds in a dry nonstick pan over medium heat, tossing often. Season with salt and pepper). apple "donuts" (apples sliced into super thin rounds core poked out with a small cookie cutter. Sometimes served plain, sometimes made into a sandwich with peanut butter). dried mini ravioli from Trader Joe's (tossed with frozen peas, butter, and parmesan, this is one of their favorite meals, and it comes together so quickly. 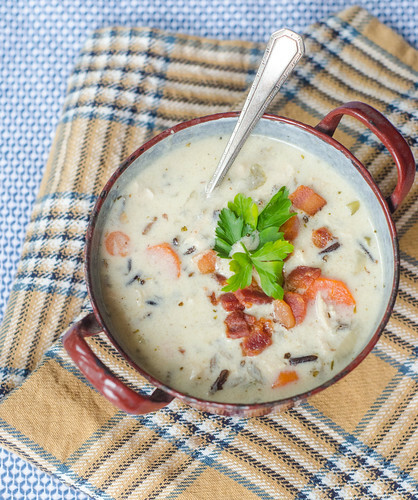 Perfect for when other plans fall through or you don't have a meal already planned). 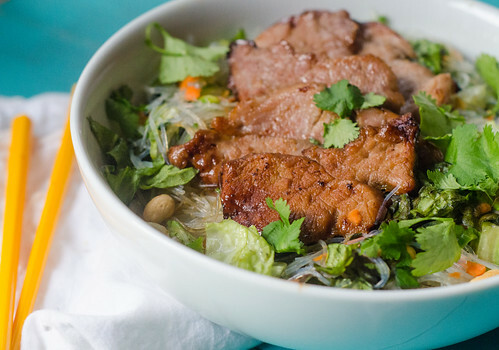 the meat and veggies from soups - soft, and the perfect texture for early eaters. Use a fork or small strainer to drain off the liquid before serving. quesadillas - use any cheese and leftover meat! halibut and tilapia, flaked into bite-sized pieces. Some kids love salmon, but the flavor is a little strong for others. chicken pot pie (fed them the filling with a spoon, then let them eat the crust on their own). "Yogurt Pops" - tubes of yogurt - frozen, then eaten like a popsicle. If you have any ideas or suggestions, feel free to leave them in the comments - I want this list to be a resource for parents, and would love to get some new ideas myself! Feedback is always welcome! Like eggplant, I feel like grapefruit is another love it or hate it food. I happen to love it now, but for many years I was firmly in the "hate it" camp. Grapefruit margaritas changed it all for me. Now I eat them several times a week during peak season. So while I love it now, I'm kind of snob about it. It has to be a ruby red grapefruit, and it has to be from Texas. Joey's a grapefruit-hater, but I may have converted him with this cake. Margaritas are my gateway drug to grapefruit, and cake is his. I've had olive oil cakes a few times, and the results have been mixed at best. But this one. Oh boy. It's good. Like gooooood good. I have to admit that I was kind of excited when I made it. Since I thought Joey was a hater, I mistakenly thought I'd have this cake all to myself. But I kept catching Joey sneaking bites. 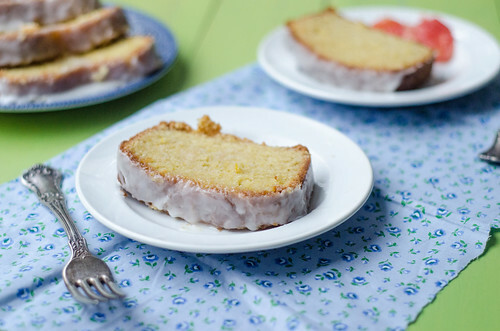 It's moist and rich, but thanks to the bright and bracing citrus flavor, it still tastes light. The olive oil is a great contrast to the intensity and bitterness from the grapefruit. It's tart enough, but too tart. It's sweet enough, but not too sweet. And it's just light enough to justify eating it for breakfast. The grapefruit diet was really popular once upon a time, right? 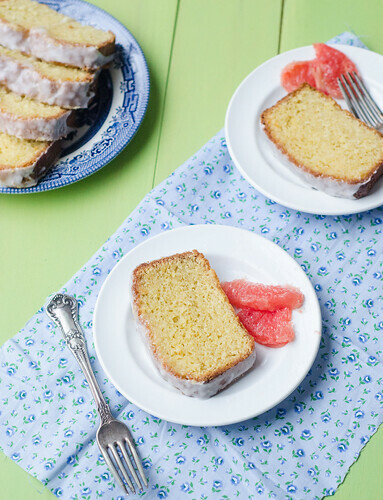 Maybe we should resurrect that and call it the grapefruit cake diet? Any takers? 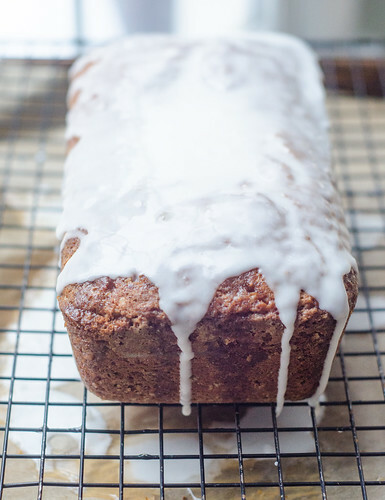 Preheat the oven to 350 degrees, and butter and flour a 9-by-5-inch loaf pan. In a large bowl, rub the grapefruit zest into the sugars with your fingertips. 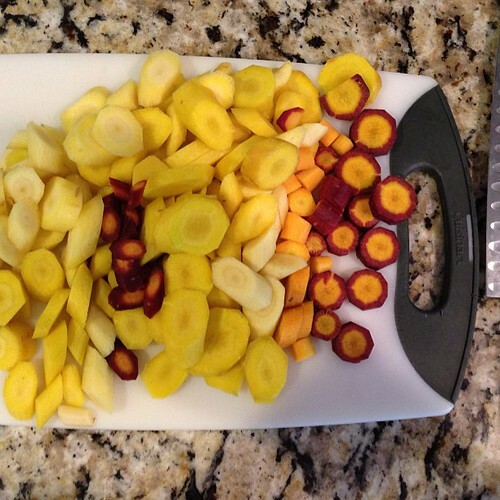 This will help it release as much flavor and essence as possible. Whisk in the oil, then the eggs one at a time, and scrape down the bowl. In a second, smaller bowl, whisk together the flour, baking powder, baking soda, and salt. Combine the grapefruit juice and buttermilk in a liquid measuring cup. Alternating, add the flour and buttermilk mixtures to the sugar-oil mixture, beginning and ending with the flour. Pour the batter into the prepared pan, and use a spatula to smooth the top. Tap the pan on the counter a few times to pop any air bubbles. Bake 45 minutes, or until a toothpick inserted into the center comes out clean. As the cake is baking, make the syrup. Combine 2 tablespoons of sugar with 1/3 cup of grapefruit juice in a small saucepan. Cook over low heat until the sugar dissolves, stirring occasionally. When the cake is finished, cool it in the pan for 10 minutes. Meanwhile, line a baking sheet with parchment paper or foil, and top with a cooling rack. Carefully invert the cake onto the rack, and use a toothpick or skewer to poke holes all over the top (don't go all the way through though). Pour the syrup over the cake slowly. Allow the cake to cool to room temperature. 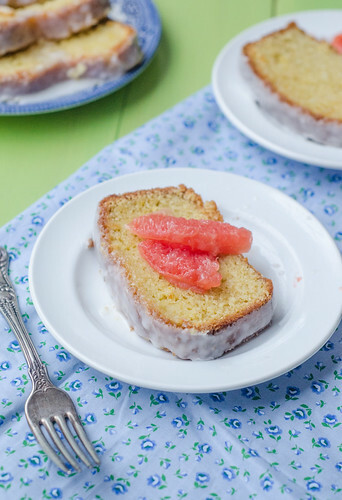 To make the glaze, whisk together the confectioners' sugar and grapefruit juice until smooth. Once the cake has cooled, pour the glaze over the cake, allowing it to drizzle down the sides decoratively. Slice and serve.